Caring for and creating a healthy living environment for children is a strategic task towards sustainable long-term national development, Prime Minister Nguyen Xuan Phuc has said. The senior government leader made the suggestion at a national teleconference on child protection, held by the National Committee for Children, on August 6. 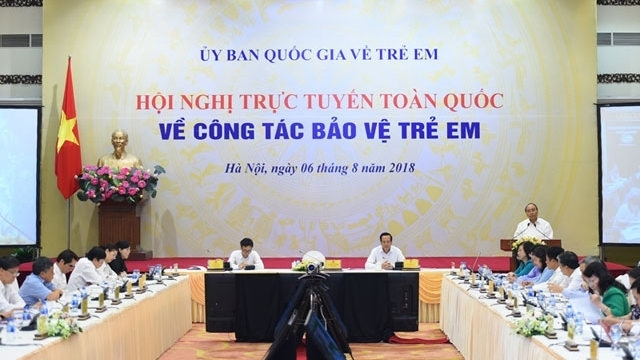 Speaking at the event, PM Phuc stressed the need to improve awareness on child protection, in order to provide better measures to care for them. He said that in the context of globalization, traditional values are fading and parents do not spend much time caring, educating or protecting their children. The lack of information on the Internet and social networks and other complexities greatly affects the personality and soul of children. Therefore, the PM stated that care and protection, along with creating a healthy living environment for children, is a strategic task and the responsibility of the whole political system, as well as of every community and family. The PM asked the commune-level People's Committees to assign specialised officials to cover the childcare work, as only 5 pct localities across the nation have allocated personnel for the work. He also suggested that the localities pay special attention to training and increasing the capacity of law enforcement and skills for the staff working in the field, while allocating sufficient resources for the work. The Ministry of Education and Training should coordinate with the ministries and agencies concerned to provide training on life skills for children to protect themselves and strengthen coordination in the work of child protection. The National Committee for Children was asked to deploy inspection missions to the ministries, agencies and localities for the implementation of childcare work. Socio-political organisations, communities and families should join hands to create a safe and healthy life for all children, the PM suggested. He called on the Ministry of Labour, Invalids and Social Affairs to coordinate with the agencies concerned and the Vietnam Fatherland Front Committee in formulating and submitting to the PM a scheme on the mobilization of social resources for childcare support among ethnic minority communities and mountainous areas, as well as launching winter clothing donations for children in ethnic minority and mountainous areas on the Vietnam Day of the Poor on October 17, 2018. “The consistent view of the Party and the State is to make the best for children. We must do everything possible to ensure that children are the first to enjoy the fruits of socio-economic development,” PM Phuc affirmed.